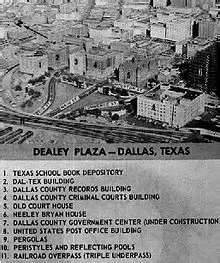 This post is the first in a series tracking buildings of Dallas, Texas, as they were fifty years ago when President John F. Kennedy was assassinated, and how they stand today. The post series is inspired by research for the second book of the Undead Bar Association Series, Shadowed Demise. Pioneer Cabin: Main Street, near the Old Red Courthouse Museum and the JFK Memorial. Visit downtown Dallas today, and you'll find a little cabin resting between courthouses and museums. It sits very near the JFK Memorial, along a section of Main Street President Kennedy traveled in the final moments of his life. But, President Kennedy never saw the cabin. Where was it in 1963? Why is it significant enough to preserve? And, who owns it? The first question is fairly simple to answer. According to this photo from the Warren Commission report, in 1963, the Pioneer Cabin was located at the corner of Houston Street and Commerce Street, next to the Old Red Courthouse (Courthouse is labeled 5; cabin is short structure to immediate right of courthouse). From research performed Mr. Kerry Adams, Curator & Exhibits Director of the Old Red Museum of Dallas County History & Culture, the cabin was rebuilt on the grounds of the Old Red Courthouse about 1936, for the Texas Centennial. It was still on that spot in 1963. Fifty years later, that spot is the entrance to an underground parking garage. How the cabin moved from it's 1963 location to where it is today...that gets complicated. Construction on the underground parking garage and the Kennedy Memorial began around 1969, so it's likely the cabin was relocated then. That's the date I used when I wrote Shadowed Demise. It's important for a writer to know when a building is relocated, if she's stashing a fictional corpse there to be discovered at a later date. Years after the underground parking garage was built and the cabin relocated, someone had an idea...let's build another underground parking garage! This was in 2006, the year I was in Dallas for my judicial clerkship. Turns out, the cabin was in the way again. It was moved, again. This gave me a turn, because when I returned to Dallas in 2012 to finish research for Shadowed Demise, the cabin was not where I remembered it. I don't know about you, but I'm not used to my landmarks moving. The second big question is, why is the cabin significant enough to warrant preservation. It must be important, since it's been moved multiple times instead of being torn down. But important why? Some people refer to the cabin as the Bryan Cabin or the John Neely Bryan Cabin. If those names are accurate, then we're dealing with one significant cabin. John Neely Bryan was the founder of Dallas, helping to plat the city, organize Dallas County, and make the burgeioning city the county seat. He played a critical role in organizing aid for people after the flood of 1866. His home served for a time as the local courthouse. Sadly, the founder of Dallas had diminishing mental capacity. He was admitted to the Texas State Lunatic Asylum, where he passed away in 1877. Is the Pioneer Cabin Bryan's original Dallas home cabin? Some assume it is. Others say it is a replica of the original Bryan cabin. According to Mr. Adams, the Pioneer Cabin was a Bryan cabin, but not the first one. If the cabin is a Bryan home, it's likely the third one the pioneer lived in while in Dallas. If anything's clear from all that, it's that the origin of the cabin isn't clear. So, we'll call it the Pioneer Cabin. At the least, it stands as a symbol of the pioneer spirit that helped make Dallas the city it is today. Personally, I like to think it really is a Bryan cabin. The Old Red Courthouse nearby, which is now an excellent county museum, has among its exhibits the Neely family bible. It's nice to think the bible is preserved in a building that sits close to the cabin where the bible lived before. Finally question: who owns the Pioneer Cabin today. According to Samantha Dodd, Research Associate for the Dallas Historical Society, in 1980 Dallas Parks and Recreation transferred ownership to Dallas County. This means, I think, that the last move of this historic city / county landmark was overseen by the county. There you have it, the recent history of the Pioneer Cabin. It may well be the oldest structure in downtown Dallas, and in the last fifty years, it's certainly travelled the most. Thank you to Kerry Adams, Curator & Exhibits Director of the Old Red Museum of Dallas County History & Culture. Mr. Adams worked with colleagues at the Dallas Historic Preservation Office on the Pioneer Cabin research. Thank you also to Samantha Dodd, Research Associate for the Dallas Historical Society.